How many ways do you know how to say “goodbye” in English? Do you abuse and overuse them? This is your chance to expand your repertoire of farewells with a lesson on the 26 most dynamic, fun, and essential ways to say goodbye in the English language. Let’s face it, “goodbyes” are complicated, they are full of difficult to convey thoughts and emotions, subtle messages and pressures, and they are often pretty important. It’s awkward in your native tongue, but in a second language it can be painful. It’s one of the most fundamental yet underestimated aspects of the English language, and it’s how people remember us. This is all the more reason to be prepared with the right expressions, and to make them a permanent part of your repertoire. 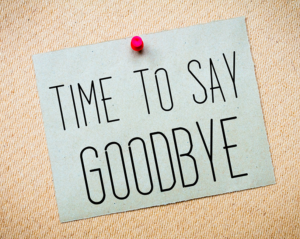 Goodbye/ Bye: Goodbye is rarely used and often as a definitive goodbye (I will not see you again) while bye is more relaxed and informal. See You Later/ See you/ Later: In see you later and see you, the “you” is pronounced as ya (with the same sound of the “u” in fun). Take Care is one of my favorites because it’s good to use in both informal and formal situations, with friends and strangers, and always seems to have a sincere feel to it. Take it Easy is another one of my favorite greetings, and it is what I use in informal situations. While a lot of people use “Take it easy” to say “calm down” (which is another use of it, as exemplified in the Eagles song “Take it Easy”), the goodbye communicates that I hope you have the chance to relax and enjoy whatever it is you do. Have a Good One is another awesome American greeting that basically wishes the other person well. You can say have a good “day” or “week” or “trip” or “vacation,” but “have a good one” communicates the general intention without focusing on the specifics of any one event. Have a nice ___________ is another common greeting that you can use in many situation. Similar to the above example, we’re always saying “have a nice day/ week/ vacation/ meeting, etc.” It’s one of the most universal and respectful ways to say goodbye to another person. This is a goodbye we well as a way to say good luck. Until…. This is not as common of a greeting as it used to be, but it is used when you know you’re going to see the person (until tomorrow/ until Saturday, etc). 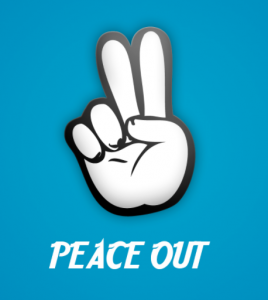 Peace (Out) was really popular a few years back, but is still pretty common in some circles. It comes from the universal expression of “Peace,” has become a verb (I’m going to peace out now. See you later! ), and is often accompanied by the two fingered peace sign. This is a semi-hip-hop informal goodbye, so make sure you don’t use it in a business meeting. I still use this one with my friends. I’m out of here (“I’m ouda here) or a simple “I’m out” is a quick and informal way to announce that you will be leaving amongst your friends. A friend of mine from Boston used to joke around with this and say “I’m outa hair like a bald man” (here sounds like hair, and “out of” also means no more- i.e. “the car is out of gas.”). (I’ll) Catch You Later/ Catch You On The Flip Side: While Catch You Later is still in popular use, Catch You on the Flip Side is a bit more rare. While, “Catch You Later” is pretty self-explanatory, The Flip Side basically means on the other side of things, when things come back around. I Gotta Jet- “Jet”, which is literally a huge passenger aircraft, has been made into a goodbye that means that you are leaving promptly (like a jet)! I Gotta Take Off- Similar to “Jet,” take off is another word that comes from aircraft terminology. Take off is when the plane leaves the ground, so when you say that you’re taking off, it means that you’re leaving. I Gotta Roll- While “roll” literally is used for things with wheels (car, skateboard), it means to make movement, so when you say “I gotta roll,” it means that you need to move. I Gotta Run- This one seems pretty self-explanatory. Although you’re not really running, “I Need to Run” indicates more hurry in your goodbye. I Gotta Split- “Split,” which means “divide” in many cases, here means to leave quickly, or to head in the other direction. I Gotta Make Tracks – “Tracks” are the footprints you leave on the ground, so when you say “make tracks,” it means to leave a trail of footprints and leave. I Gotta Hit The Road- “Hit” in this sense means to “get on” or “start” on something, so “Hit the Road” mean to leave/ start moving on the road. I Gotta Head (Out) – “Head”/ “Head out” is another cool way I announce my departure regularly. Head as a verb is to “go in the direction of.” It makes a lot of sense because when you move directions, you always start with your head (physically and intentionally). Head Out is literally to “go away from here,” and then some people just started dropping the out altogether. 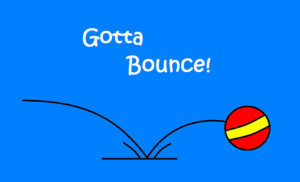 I Gotta Bounce- “Bounce” is what a basketball does when you dribble it with your hand, and it represents the initial conscious effort/ push you make to leave (it’s often not easy to bounce yourself away from a party). Now that we’ve covered 26 ways to say goodbye, it’s time to learn how to use them. Remember, it’s one thing to read an article, but quite another to apply them in real life. You can sign up for our newsletter for free here to get your free copy. We also encourage you to join the RLE International Facebook Group here for daily tips and community support. If you liked this article, you’ll love 23 Ways to Greet / Say Hi to Someone in English. I gotta Jet Now! Very useful indeed. Thanks for sharing . Sharing is caring. Great article Justin! What a great article to share with my students so they can sound a little more fluent. One thing I would comment on is that I’ve mostly heard Californians say “Peace (out)”. In Boulder, Colorado, I think a lot of people say it because of so many Californian students study at the university, so they’ve influenced local language. Just an observation I’ve had. Hi Justin. I'm Shen from Malaysia. Currently living in Japan. I appreciate your posts and sorry that I introduced it in my blog http://naruhodo.jp.net in japanese language, as I thought it'd be very useful tips for Japanese English learners ^^ thanks and looking forward to your awesome posts. Hello Justin! How are you? Oh, talking about that… I swear!!! I’ll make a review about you on iTunes, Hahaha! Now, about this article, could you help me to clarify something? I’ve never hear this expression before, neither in movies or the rest of time that I spent in Canada. Just this man said to me. So… this expression is common? Hey Elton, Thanks for the cool comment. That was nice of you. As far as what the guy said, I would say “all the best,” or “Best of luck,” but do you think he might have said “all the best for you”? I’ve never heard “the Best for you.” That would be more like if you buy a nice dinner for your girlfriend and you say “only the best for you.” What do you think? But I’m sure that he said “…the best for you!”. Anyway… I remembered when I heard this expression there were some friends from Japan, Germany and South-Korea with me (all of them were english learners too), then… I asked them if they knew what this expression means or if they heard this before, and like me… nobody knew. Hey Elton, I’m sure you heard right! I think it’s definitely possible. There are a million accents out there and I’m still learning. Thanks for sharing! hiiiiiii, thank you very much……………..now I will use new ways to say goodbyes to my friend……….i really like your article bcoz I always learn new things here…thanks. We've reblogged your post. http://wp.me/p11QFO-gI Thanks so much for the great information. Thank you! It’s an honor! Thank you so much! That's awesome. I hope it's useful to your readers! Hey Shen, Sorry, I just saw your message. That's fine that you translated it and posted it. I'm gonna link it to this page too to give our readers that option. Your blog looks really cool by the way. I'm glad it's useful. Thank you for commenting! It’s never too late to go deep inside of a language. Guys, you really made me feel speechless every time I read something from you. Thanks João, I appreciate your nice comment. Good job on your English and thanks for reading. GREAT, I love this, a new angle to teaching greetings and importantly: GOODBYES, which is even harder many times. My students have been asking for this kind of info so now I'm able to provide something new for them. Keep up the good work! ohhh English is so fantastic!!! Great description of native ways of saying good bye! I was having a trouble as I’ve been saying bye and have a great day every time I talk in English. Let's make like a tree and leave (leaf). Let's make like a baby and head out. I dislike it whenever people are saying ‘peace’ or ‘peace out’. It either makes me think of hippies or Negroes. Hey there, Chinese! Thanks for reading and sharing your perspective. Yeah you’re totally right. It’s definitely informal, but I wouldn’t limit it to a specific race or group of people, although that is the tendency. Thanks again! My pleasure. I am just giving an idea of the stereotypes one may associate with it. Wait, what is the actual problem of it making you think of negros? how about ” me so horney” or “you want flied lice with dat? This was very useful. I have a college that use lots of slangs and he almost used 50 percent of these informal ways of good buy 🙂 Very interesting! Thanks so much, Tata! You rock!